The pre-eruption island (wikipedia). The camera is looking to the south. The dome at the front is from the previous eruption, in 1992. Click on the image for full resolution. A year ago there were frequent eruptions of Bogoslof volcano. But over the months, it dropped out of the news, as the eruption quieted down and finally ceased. This brief post is a recoup of what came before, and what the state of the island is now. 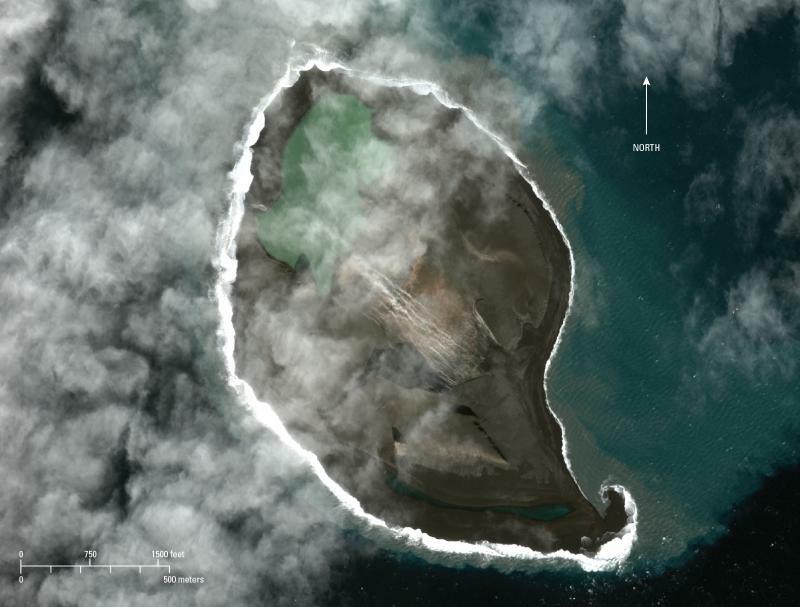 Bogoslof is one (and sometimes two or three) of around 70 volcanic Aleutian Islands, part of possibly the most obvious volcanic arc on Earth. The Aleutian arc links Kamchatka to Alaska. Here the Pacific Ocean meets the Bering Sea in a titanic collision. The run-in happens at about 7cm per year with the Pacific plate the subducting one. Bogoslof Island is just north of the main arc, sometimes considered part of a back-arc. It is at the same latitude as Edinburgh, so not as far north as you could have imagined. It is cold, though, with temperatures rarely above 20 C and average temperatures in winter near freezing. Rain happens on most days. The island is not large. The surface area is (or rather, was) less than 1 km2, and the highest point no more than 150 meter above sea. It is the tip of a submarine volcano, desperately trying to get above water but every time an eruption raises the peak, wave erosion reduces it again. But it has managed to keep its head above water, so it may be destined for great things. Just give it time. Submarine volcanoes grow easily until they reach the water surface. At this point erosion is suddenly much more severe, because of the incessant waves: a flat-topped mountain develops, limited in height by wave action. If the island can grow faster than erosion takes it down, there is hope: once much of the island reaches a height well above the high water line, erosion again becomes less. Below the surface, the mountain of Bogoslof is about 2 km tall, so 10% of the height, but much less of the volume, is above water. Even a small increase in height would make the island much more resilient. The island reportedly first emerged above water during an eruption in 1796; at the time this region was Russian. However, it clearly is older than that. An island appears (unnamed) on a map from 1768, much smaller than Bogoslof but at the same position. It was also on Captain Cook’s maps of 1778. Wikipedia reports eruptions in 1796-1804, 1806-1823, 1883-1895, 1906, 1907, 1909-1910, 1926-1928, 1992, and now 2016. 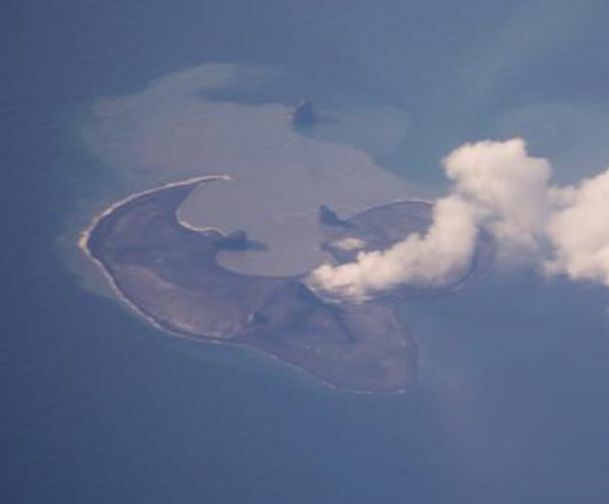 It is not always the same point: sometimes eruptions come from next to the visible island. But it is always the same volcano. The youth and instability explains why the island remains uninhabited. Each eruption changes the island. The map below shows the outline as it was around the second world war, surveyed by the US department of war. Castle Rock, the steeple seen in the photo, is the remnant of the dome extruded in 1796, also called Old Bogoslof. 500 meter away is a second island, Fire Island, remnant of another eruption. It is tiny, and lost half its size between 1935 and 1947. At one time it was the largest of the two. The maps below show the development of the island, with panel A from 1768 and panel I from 1947. At times there were three separate islands. Ship Rock (called Sail Rock at a time when ships still had sails) mostly collapsed in 1890. The 1992 eruption occurred at the north end of the island and changed the map considerably over there. After the 1992 eruption, erosion took its toll. 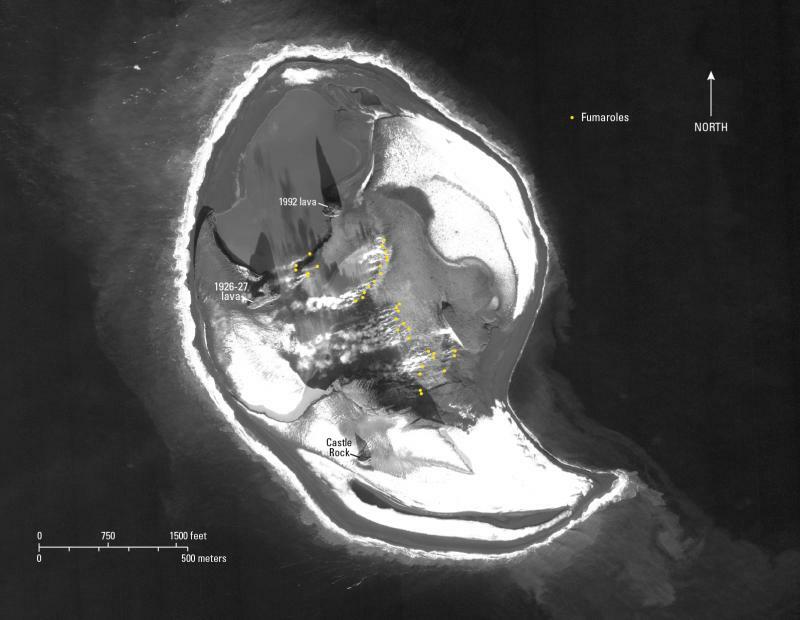 By 2015, the area of the island was down to 0.3 km2. 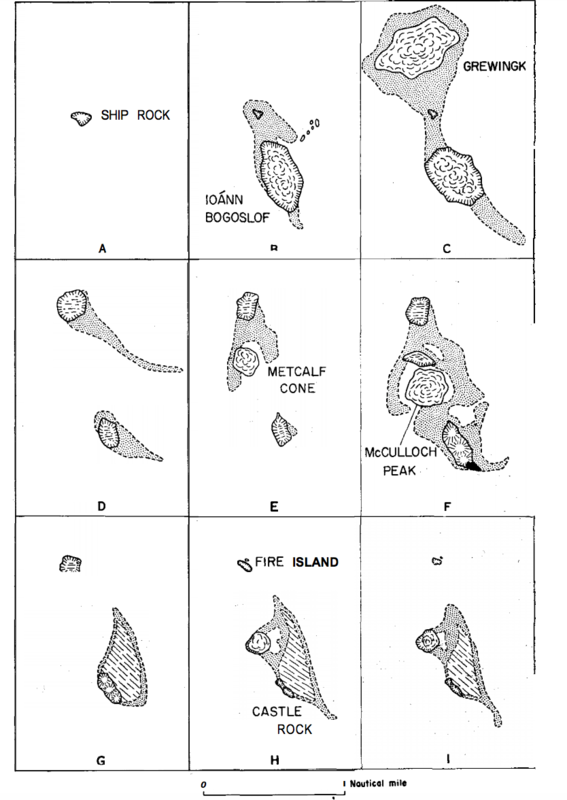 Changes in Bogoslof Island between 1768 (panel A) and 1947 (panel I). B: 1796; C: 1889; D:1895; E: 1906; F: 1907; G: 1922; H: 1936. 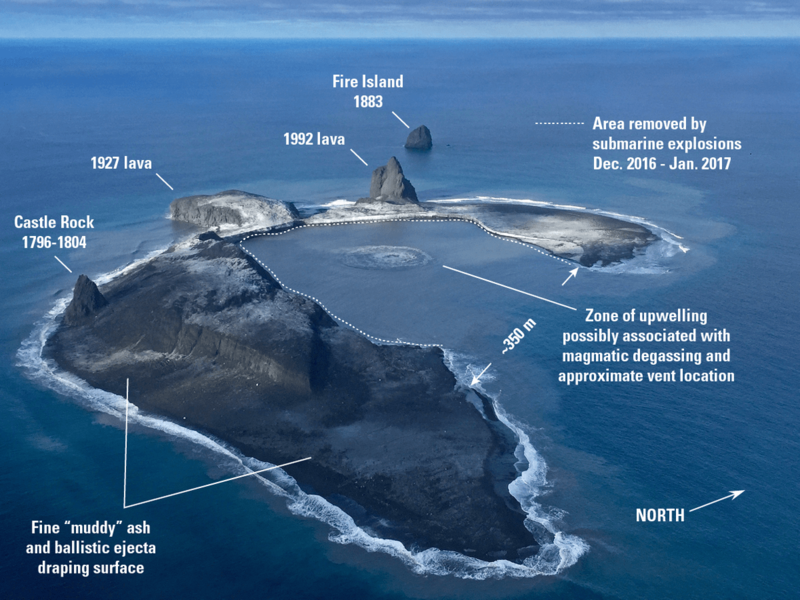 The dome south of Ship Rock is known as Old Bogoslof, and the island to the north is New Bogoslof (now reduced to Fire Island). The current eruption started on Dec 20, 2016. There is no monitoring equipment on the island and the eruption was first spotted from the air. 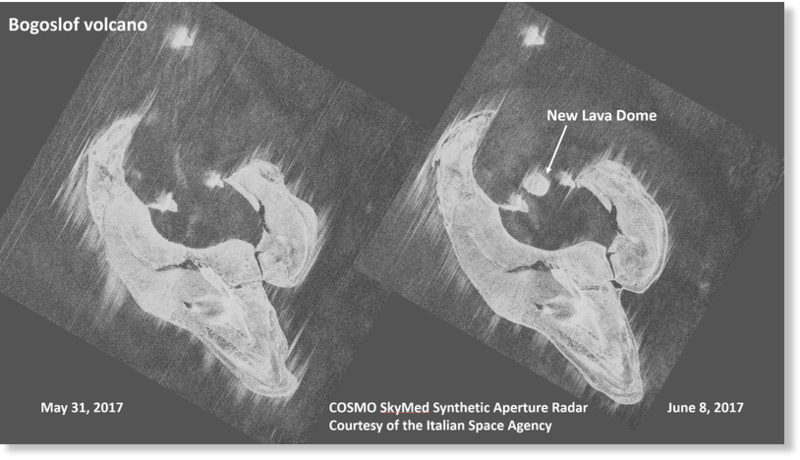 A second eruption occurred on the next day, detected by satellite, and strong seismic activity was followed by a third explosion two days later. The wind was blowing the ash and sulphur to the north, away from inhabited areas. The eruptions were brief, with the one on the 23rd lasting for just over an hour. The ash clouds caused a lot of lightning and this has been detected (there are no reports whether it was detected from New Zealand, as in the case of nearby Okmok). There was yet another explosion on the 26th. Each explosion caused an ash cloud to some 10 km height, similar to the previous eruption in 1992. But the eruption that year lasted for 2.5 weeks. The eruption of 2016/2017 lasted considerably longer. 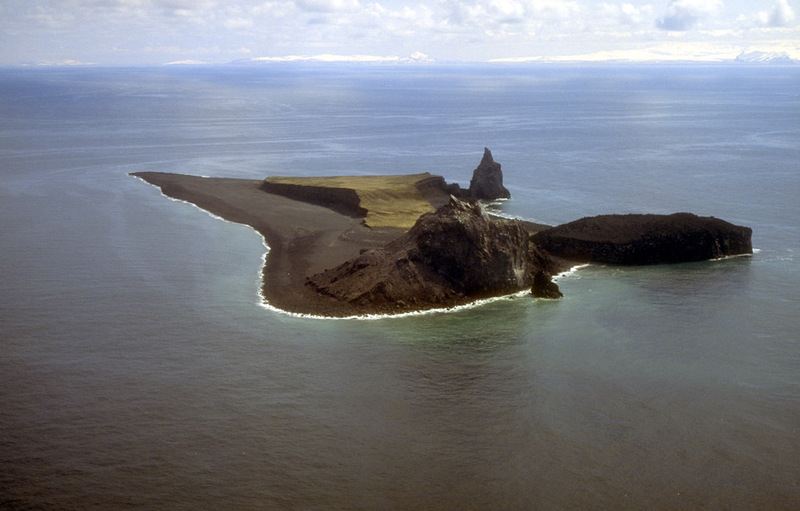 The eruptions quickly redrew the map of Bogoslof Island. The map below shows the immediate changes, in late December 2016. The dashed line shows the shore line as it was a year earlier. The eruption site appears to have been near the shoreline. It is almost the exact position where a Navy hut had been erected during the war. The area around this site collapsed below water, whilst the ejecta created new land further out. 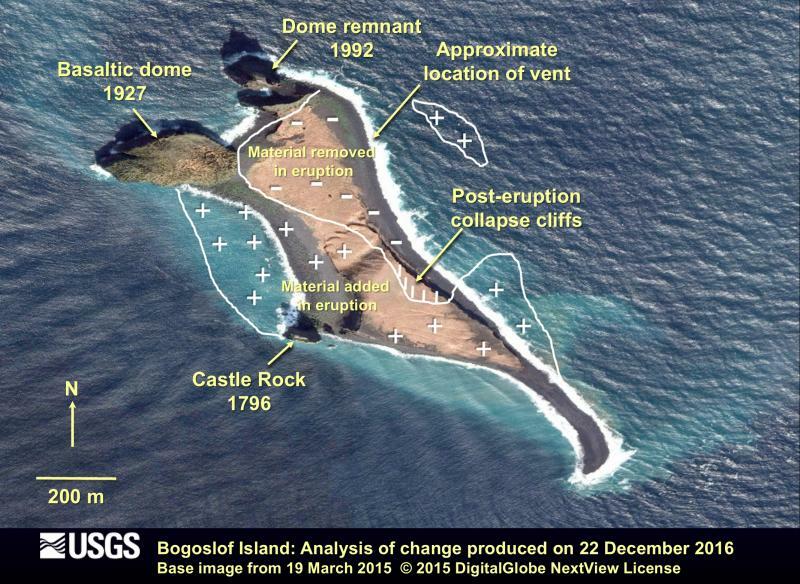 The images shows that the domes from the previous eruptions had survived. Later, the 1927 dome would take more of a hit. 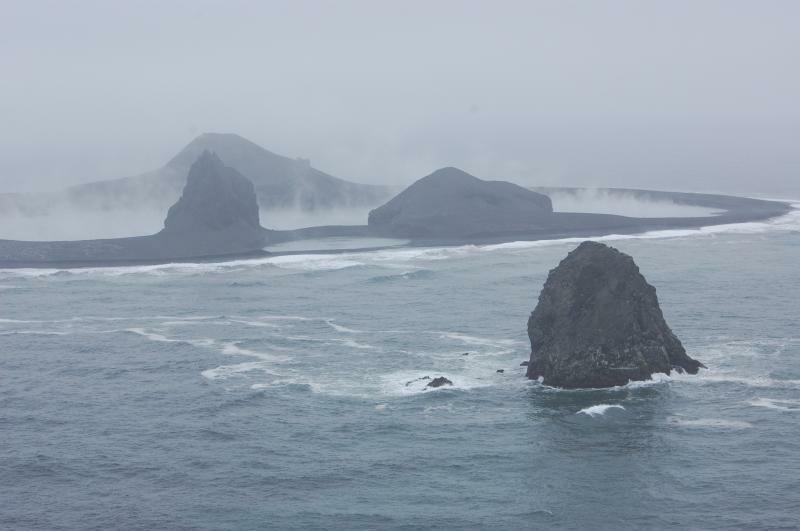 The shore line of Bogoslof Island after the first eruption of Dec. 2016. (white line) superposed on an image from 2015. 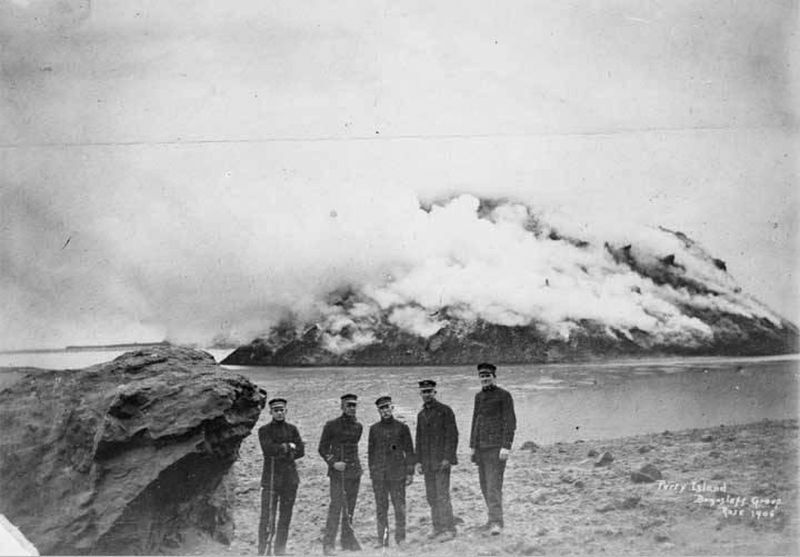 The explosion pushed a large fraction of the island back underneath the sea. The first explosions destroyed much of the island. It broke the island first into two, and than into three separate pieces. That was the low point for Bogoslof: things got better after this. 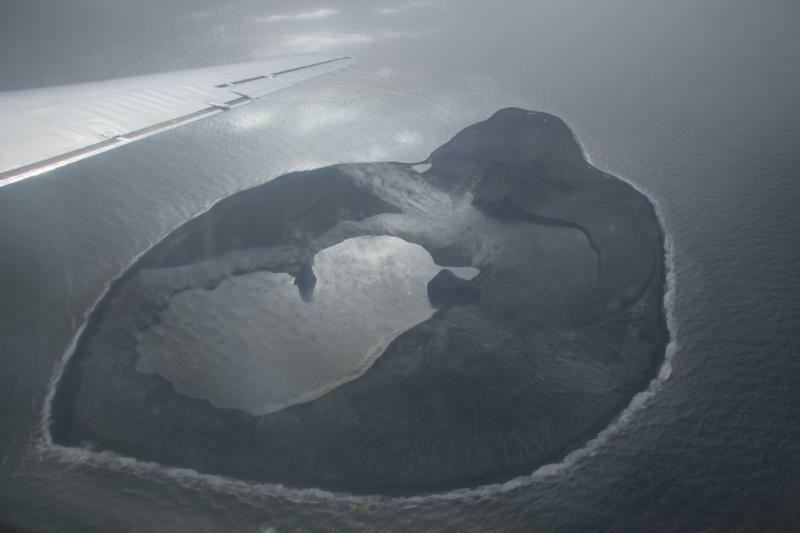 The tephra was thrown out into a shallow ocean: the flat top of the underwater volcano surround the island. Therefore, to was easy for Bogoslof to grow, not only regaining the lost regions but also expanding into the surrounding water. By late January it was back to being a single island, and by March it had grown to an area of 1 km2. 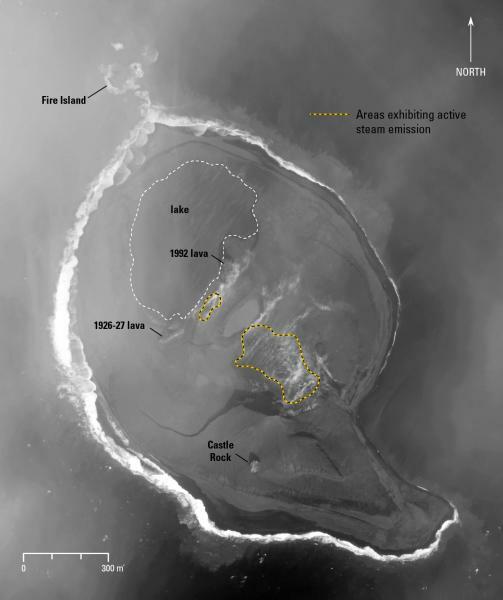 After 36 explosive events, by mid March the island had formed a full crater. The explosions had thrown up a ring, partly outside the previous island, surrounding a lagoon. At times this lagoon connected to the ocean, but at other times it became a lake. There are few images of the island itself, during the eruption. This one gives the best depiction of what it looked like at close quarters, showing the old peaks, the new ring, and the steaming lake, heated by the volcanic acitvity within. Every now and then a new explosion would take place in this lake, remodeling the ring. The poor weather is the main reason that there are relatively few images. Radar can provide a useful addition. Here are two images taken in May and June 2017, showing a dome beginning to grow in the earlier crater. By June, the part of the rig had eroded away and the lake had become a bay. Now the volcanic activity was clearer to locate, and the appearance was almost that of a traditional volcano. Weekly eruptions continued throughout the summer but the events became short-lived, perhaps they no longer took place under water. In August activity further declined. The last reported explosion, a five minute affair, was on 30 August 2017. By that time, the volcanic smoke signal had gone, and the ring had closed again around the lake. By October, the lake was still there but looked shallow. The volcanic centre was now the place of vigorous fumarole activity. An image taken in December 2017 shows snow cover. But the central areas are snow free, and this will in part be because of the underground, residual heat. The fumaroles are still there, direct evidence of the warmth. By February 2018, changes had become few, but the ocean currents had added a nice fishhook at the bottom of the island. The fumarole activity seemed less, but this may just be due to the weater being a bit warmer. 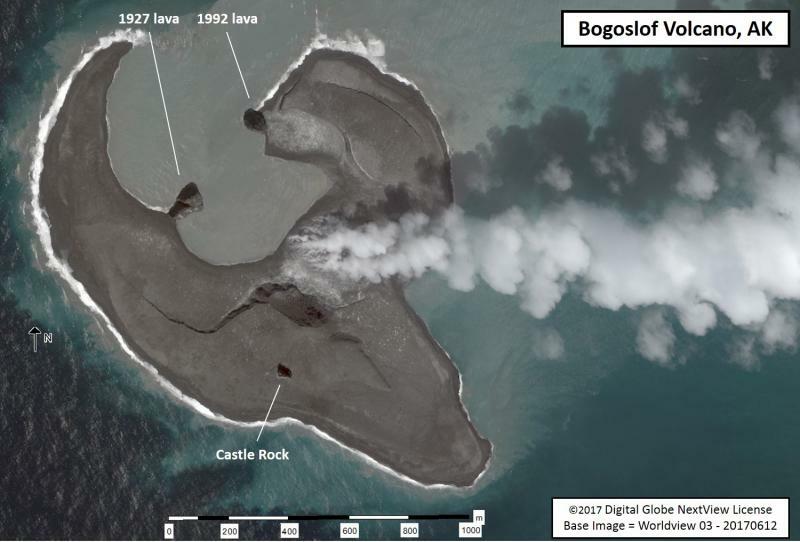 Bogoslof was now 1.6 km2 in area, five times larger than before the eruption. The destructive explosions ended up creating new land. This has happened before, and experience has shown that over the next years, the new land will slowly erode away. The soft tephra will be attacked by the ocean. Bogoslof is in a fight with the waves. To survive, it needs to grow. 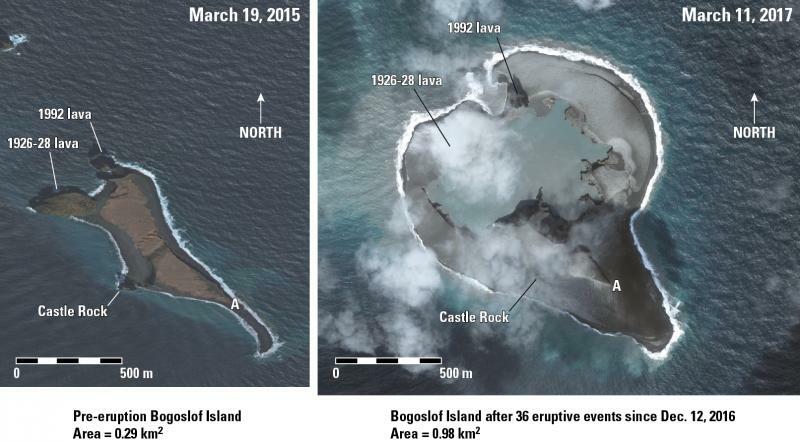 It will take many more eruptions to create a lasting Aleutian island. But chances are that this will happen. 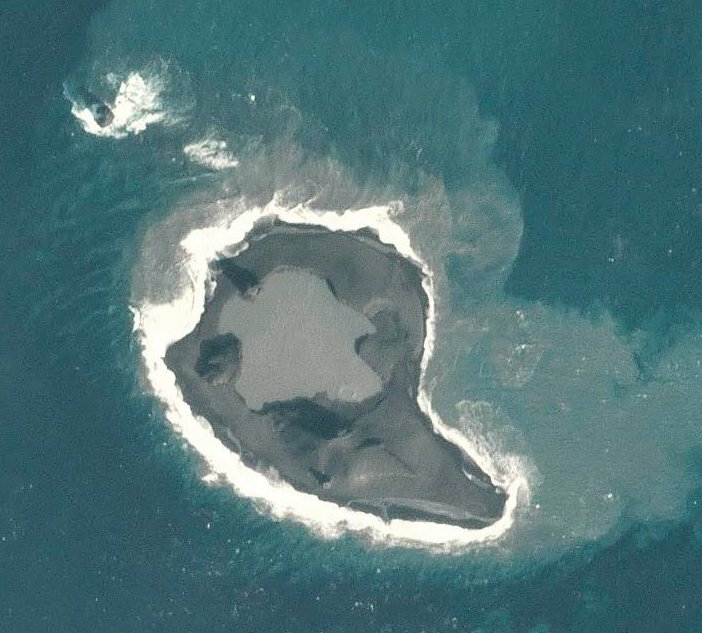 Last year was a small step in the growth of this island volcano. There is more to come. Bogoslof Island is important for wildlife, with populations of several thousand Stellar sea lions and northern fur seals (both declining), and close to 100,000 sea birds including guillemots, tufted puppins, a small number of pelagic and red-faced cormorants, and two kinds of kittiwakes. The green areas have gone: there is no sign of any plant cover, while before the eruptions significant parts were covered in grass. There are no reports of the wildlife over 2017. Now that the activity has ended, the previous inhabitants should begin to return. They will find a much changed land – they may miss the grass, and all food will need to come from the sea. But they should love the extra elbow space. Tufted Puffin on Bogoslof Island, wondering about the future. Thanks for another great post, Albert. As my interest and knowledge of volcanoes grows, I’ve learned a new feeling of time, so it’s startling to see this “evolve” so quickly. What turned the lake green between December and February? Volcanic chemistry? You also get it in glacial lakes. It can be caused by suspended particles with a size of 1-2 micron, which scatter light back at you. It could be sediment, or it could be minute air bubbles. Algae can also do it but this is less likely in February. Of course it is a bit guessing what causes it. The fall of TIANGONG-1 has been moved a few hours later, either very late on Saturday or any time until late evening on Easter Sunday. The reason is the lack of solar activity! The outer atmosphere is not as warm (extended) as it was predicted to be, buying the space station a few more hours to live. No one is on it, right?? but does bring to mind sf short story “The Cold Equations” by Tom Hardy …. a few more hours to live…. Yes, those old astounding/analog stories were unbeatable when at their best. I can suggest, for the technical reader, that they read Asimov’s doctoral thesis “The Endochronic Properties of Resublimated Thiotimoline”, they should not be dissapointed. There are follow-on papers on this subject. Didn’t know that volcanic islands rely on standing on one leg whilst jumping! Think you have a missing e there. Thanks for pointing this out. There was (too) limited time for proof reading. Must have had my mind on the weekend beer. The eruption actually started on Dec 12th, the first few explosions weren’t detected but were noticed in retrospective data. Another star at Bardabunga, this time at the Northern rim. I thought we expected more activity at the southern rim first. This how I understood the “Tomas A model”. New breaking post went up overnight. And it is a big one. Many thanks for another great article. 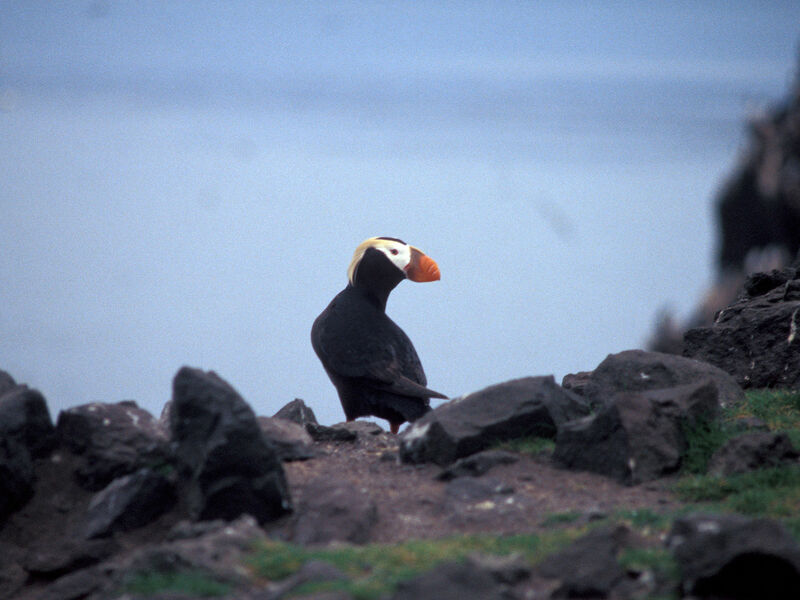 Just above a fine photo of a Tufted Puffin is ” … close to 100,000 sea birds including guillemots, tufted puppins, …” which I suppose should be altered. Great article.. I really would like to see one like this about Nishinoshima..